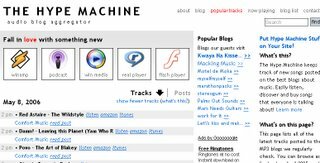 The Hype Machine is an experiment that keeps track of songs posted on the best blogs about music and presents them in an easy to consume manner. You can easily to listen, discover and buy songs with The Hype Machine, but you can not download music. The only thing you can do is put The Hype Machine player on your blog or website.